The driver of the No.M1 Page Trucking machine, Dave Marcuccilli, has been having what most would call a dream season. The sportsman driver out of Montezuma, N.Y. has collected 16 victories so far this season. “That’s more than some drivers get in their career,” said Marcuccilli. With ten years of sportsman racing under his belt, it was only a matter of time for Marcuccilli to have his breakout year. Marcuccilli currently leads the points chase at his Saturday night home track, Land of Legends Raceway. He has collected five wins on the season at Land Of Legends, plus victories all across central New York – Outlaw Speedway, Can-Am Speedway, Utica-Rome Speedway, and Brewerton Speedway. Running weekly at Land of Legends Raceway and running at as many tracks as he can, Marcuccilli has proven that he is a force to be reckoned with. 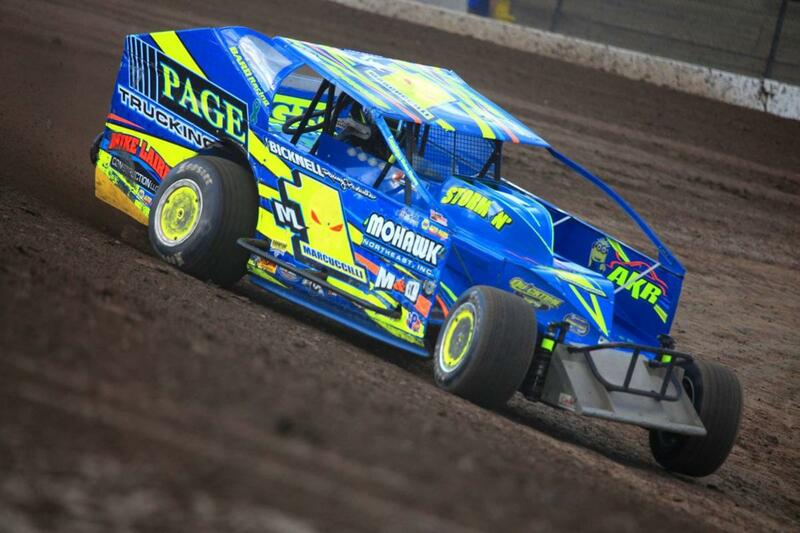 Marcuccilli has been a dedicated customer to Bicknell Racing Products since day one. With ten years of experience under his belt with Bicknell chassis’, Marcuccilli would proudly recommend Bicknell to anyone. Looking ahead, Marcuccilli will be continuing his busy schedule in central New York with his No.M1 sportsman, however, Marcuccilli would be open to dabbling into some small block modified racing come Fall. If the right opportunity arises, we just may see Marcuccilli make his small block modified debut this season.